Star Trek: Voyager characters should be in the new Star Trek movie. It just makes sense. We should try and get them in. Star Trek: Voyager was a controversial show. On the one hand it's the first show to have a female captain. On the other hand, "Threshold" is the worst Star Trek episode ever. J.J.Abrams loves great characters. Voyager has great characters. Bring them together and the new Star Trek movies become more amazing. But what characters and how? Since Voyager takes place in the 24th century the dates are challenging. The new movie takes place in 2258 while the events of Star Trek: Voyager happen in 2371. That's a gap of over 100 years. The accident that sent the crew to the Gamma Delta Quadrant could help solve that problem. Like the first Star Trek (2009) movie used a wormhole to send Spock back in time, the Caretaker could send them back in time. The entire ship and crew could be sent to the 23rd century while being sent to the Gamma Quadrant. Like Admiral Archer from Star Trek Enterprise, it would open all kinds of opportunities. Take Tuvok for example. Tuvok (Tim Russ) was Captain Kathryn Janeway's (Kate Mulgrew) tactical and security officer. He's the first black Vulcan we've ever seen. He epitomizes IDIC (Infinite Diversity in Infinite Combinations) as a study in opposites. Vulcan, yet black. Logical, yet head of security. Abrams would find him fascinating. But how? Here's a couple of ideas. The planet Vulcan has been destroyed in the new Star Trek movie timeline. We haven't seen all the Vulcans though. Tuvok's family could have survived and the movie could feature his Grandfather. Maybe Tuvok was named after him. Or, since Vulcans live so long, Tuvok himself could be there. Since the Vulcans are in a new colony he could be the sheriff or head of security for the colony. Maybe it's impossible. Maybe it doesn't make sense. Maybe Abrams wouldn't care. But it's worth a shot. Capt. Kathryn Janeway, First Officer Chakotay, Security Chief Tuvok, Neelix, The Doctor, Chief Engineer B'Elanna Torres, Lt. Tom Paris, Ensign Harry Kim and Seven of Nine would all be fascinating in the 22nd century. Should Voyager Be In New Star Trek Movies? Let's start a campaign to get them in. 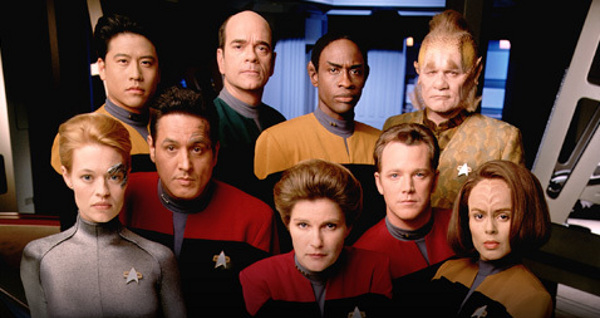 Do you have a favorite Star Trek Voyager character? Should the new Star Trek movies have characters from Voyager? If so, how do you think they could be added? Let us know in the comments. I don't think that's very likely. I'm sure my sisters would love to see some "Enterprise" characters show up, which would be more plausible since that's a prequel. If they were going to add anyone else it'd probably be someone from the Next Gen like Data or Worf. I agree.....background cameos would work - a book store clerk.... a bartender.... The possibilities are numerous. Yeah Natasha. Even if they just popped up in the background fans would go nuts. Definitely David. I'm certainly not suggesting a whole Janeway movie, but it would be cool if someone named Janewaywas there played by Kate Mulgrew. Actually, I don't agree, because I love "Threshold." It says so in my episode guide. And creators can "confess" whatever's convenient to confess. Braga is not usually credited with being savvy, but it was certainly savvy to discredit an unpopular episode. It was the same way with the Lost creators in their third season. Doesn't actually mean they were making tons of mistakes that year, but it was popularly expedient to say so. well the direction of the first film star trek  all the events have changed, so no to them being in any film... heck next gen should change... as well. Voyager was probably my least favorite. I'd rather see new characters in the movie. Tony, thanks for the correction! I sometimes get the quadrants confused. Kudos to your nerdy Star Trek mode. You're right it's better to try and fail than never try to think out of the box. On the other hand, Braga called it a "steaming pile." I think we can agree that it was not one of their best episodes. Thanks for the heads up on "Flashback." That would be a fascinating twist to the character and would fit right in. I think if there are crossover appearances, then they should be limited to cameos and ones requiring time travel would probably need too much explanation. According to Flashback, Tuvok's was born in 2264, so I think that rules him out. T'Pol, Phlox or Shran might still be alive a hundred years or so after Star Trek: Enterprise, and it would be great to so any of them in a cameo. Maybe Guinan would be another good one. In other news, I like Threshold. I would say Course: Oblivion, Fair Haven or Friendship One are all more likely candidates for worst episode. Voyager ended up in the Delta Quadrant. Deep Space Nine entered the Gamma Quadrant via the wormhole and ran into the Dominion. The Borg typify the Delta Quadrant. "Threshold" is hardly the worst episode of the franchise. It's simply a episode a lot of fans have a strong reaction to. There are worse episodes. I would always call a pointless episode worse than one that tries to do something, or stands out. In the Voyager episode "Flashback," Tuvok is serving aboard Sulu's Excelsior, putting him in the ballpark of Kirk's era. However, he would be a young (and as demonstrated in other episodes, extremely troubled) man, so maybe it could work in the manner you suggested. Crossovers would be interesting. But their characters might be different in the new time zone unless they did employ the old time-space continuum. I recently re-watched all of the Voyager series (for the second time - I really have reached the end of NetFlix) and it's a much better show than I remember.